Italian soprano Maria Agresta is a fine Mimi whose gentle demeanor matches her poetic profession of embroidering flowers on silk and other materials. In contrast to her earlier playful rendition of “Mi chiamano Mimi,” when she met Rodolfo, Agresta’s last murmuring of “my name is Mimi, brought tears to the eyes as she died. Chicago audiences may remember her as the slave girl, Liù, in last season’s “Turandot.” She also has sung at several opera houses including the Met and Royal Opera. 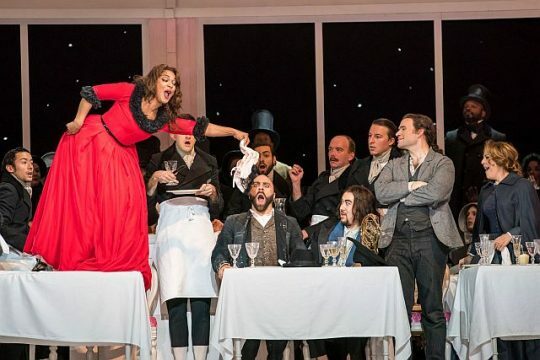 In the Lyric production, Mimi’s fragile being appears even more so as audiences are introduced to a very robust Musetta (Australian-American soprano Danielle De Niese), the temperamental singer who cares for Marcello but torments him with her flirtations. Her table-topping antics at the Latin Quarter’s Café Momus as she sings the risqué “Quando me’n vo ” (Musetta’s waltz, “When I go along”), is hysterically funny. It embarrasses her companion, Alcindoro (American bass-baritone Jake Garder who is also the landlord, Benoit) but works as she wanted on Marcello. Internationally known and in demand, De Niese has a wonderful voice which might have been forgotten by some opening-night listeners as she screeched some of her tempestuous lines. Speaking of the café scene, that was one of many delightful changes in Jones’ production. The street scene with members of the Chicago Children’s Choir was delightful. Parisian shops visited by Rodolfo, Mimi and their friends are enticingly recreated as tall, triangular shapes with interesting displays including corsets. The bohemians’ garret is also artistically re-imagined in a trapezoidal form with a half-door that affords a small entry at the top of a stairway. The only problem with the new set design is that the opera’s romantic and troubling moods are disrupted when the sets are moved between Act I and Act 2 and later going from Act 3 to Act 4. Maybe a dark gauze curtain or the regular drop that goes down at intermission could also be used to keep audiences focused and thinking about the characters rather than how the garret is laboriously moved back and turned and how the next set is moved up. 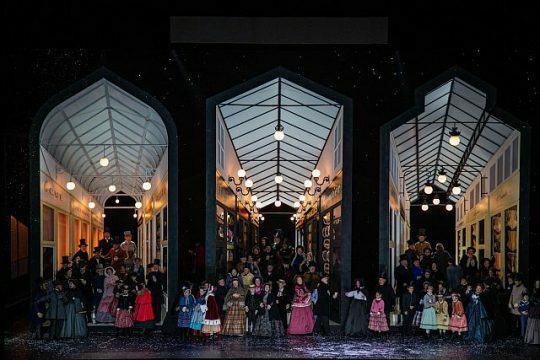 A co-production with London’s Royal Opera House and Teatro Real Madrid, the Lyric Opera’s “La bohème” is a must for opera lovers and good for introducing non-opera goers to the genre. 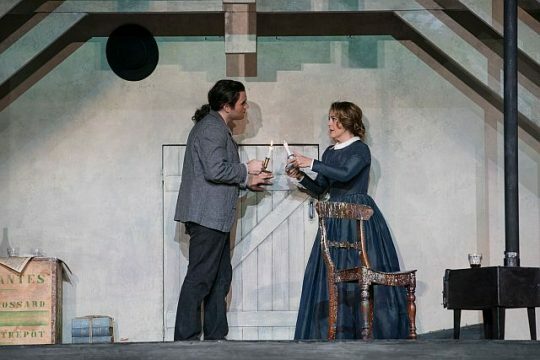 DETAILS: “La bohème” at the Lyric Opera House, 20 N. Wacker Drive, Chicago, has four more performances through October 20 and six performances in January 2019. Running time is 2 hrs., 15 min. with one intermission.For tickets and other information call (312) 827-5600 and visit Lyric Opera /La boheme.